Introducing the new KOHLER Command PRO® EFI 999cc with ETB Technology. What’s ETB you ask? 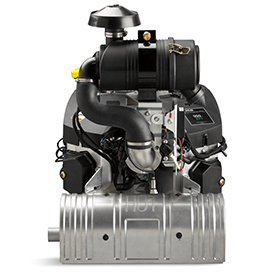 Stands for electronic throttle body — in English that means you get more power to your mower blades in faster time. We’re talking crazy power. Wet grass, tall grass, hills, pumpkins, corn fields — there’s nothing you can’t cut. More Power — the ETB electronically controls intake to maximize power during heavy loads. Better Cut — maintains blade speed during heavy loads; no need to cut the same grass twice. Hydraulic lifters mean zero maintenance on the valve train. Saves significantly on fuel, with less downtime for refueling.